It’s an undeniable fact that print, as a medium, is in decline. The public’s media habits are shifting and market-savvy fashion glossies are strategically solidifying their titles. This November, Condé Nast announced that our beloved Teen Vogue would transition to a digital-first publication, producing only four coffee-table-destined “keepsake” issues a year. Last week, Complex became the latest magazine to do away with its print product entirely. So you might say that, in these uncertain times, a magazine’s choice of cover star is more telling than ever. Which is why we’ve cheered extra hard over the past year when certain issues hit the newsstands. Curve model and body positivity activist Ashley Graham’s August Cosmopolitan cover, for one. Transgender actress Laverne Cox’s chic, impeccably styled LADYGUNN cover, for another. There’s gorgeous Priyanka Chopra’s Gucci-clad InStyle cover. And we mustn’t forget T Magazine and Vogue’s respective tributes to the first lady. Nor Rihanna’s provocative turn on CR Fashion Book. Nor Babs’ sensual, stunning, sophisticated W appearance. Suffice it to say, we had high hopes for the year’s magazine diversity ratings. And while the numbers don’t quite do justice to the state of the industry at large, they’re far from discouraging. After tallying 679 cover model appearances across 48 top international fashion publications, we found that, when it comes to race, magazine covers were significantly more diverse than in prior years. 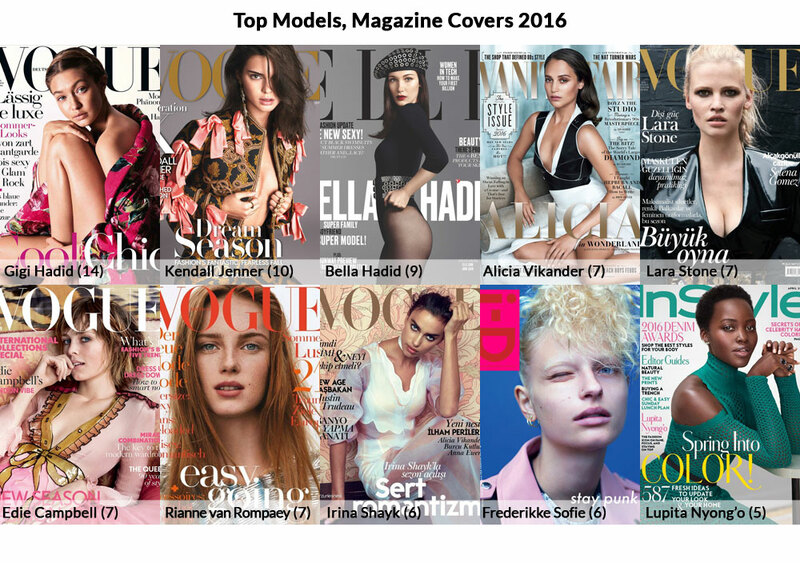 In 2016, 29 percent of cover models were women of color, a fairly respectable 6.2 point increase from 2015. 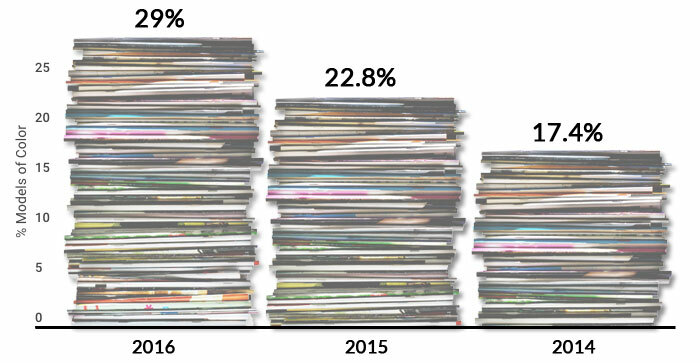 For context, racial representation on magazine covers rose by 5.4 points between 2014 (17.4 percent) and 2015 (22.8 percent). This figure dwarfs the slight improvements we saw on the Spring 2017 runways, which were 25.4 percent nonwhite — a mere 0.7 percentage point increase over the previous season (Fall 2016). Vogue’s British edition didn’t do much to address its inclusivity problem this year. 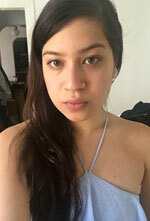 While its well-meaning editor-in-chief, Alexandra Shulman, dedicates herself to the topics of body positivity and “realness,” the mag continues to gloss over the matter of racial inclusion. To wit: Rihanna was the only nonwhite person to front the publication in 2016. Last year, supermodel Jourdan Dunn was the first model of color since 2013 to earn a solo cover. In fact, over the past 14 years, only six models of color have merited stand-alone British Vogue covers. Seems like an easy fix for an industry leader keen on setting forth “broader definitions of physical beauty”. On a more positive note, a handful of well-respected glossies championed the diversity charge this year. Vogue Taiwan and Vogue India were front-runners in the fight for change. The Taiwanese monthly shot solely nonwhite cover stars while, for the second year in a row, the vast majority (16) of Vogue India’s 19 leading ladies were women of color. As in 2015, half of Paper magazine’s cover roster was people of color, including Naomi Campbell, “Fade” star Teyana Taylor, Bollywood beauty Deepika Padukone and Beyoncé protégées Chloe and Halle Bailey. After a much-discussed, totally whitewashed 2014, soon-to-be quarterly Teen Vogue continued its rebranding mission. Mirroring its 2015 stats, six of the publication’s 2016 cover stars were women of color. Amandla Stenberg, who identifies as bisexual and nonbinary, fronted the February issue, Willow Smith graced May, Zoe Kravitz covered March, Gabby Douglas and Simone Biles — two-fifths of the Final Five — aptly owned August and black-ish star Yara Shahidi finished out the year (but shared her spotlight with Rowan Blanchard). Of course, diversity isn’t limited to race. How did the year’s magazines fare when it came to body type? In a word, miserably. Of the year’s 679 cover model appearances, a whopping six (or 0.9 percent) belonged to women size 12 and above. Ben Watts shot Ashley Graham for Cosmopolitan’s groundbreaking August cover. “Queen of Hearts” Adele blessed Vanity Fair’s December issue and American Vogue’s March edition. To coincide with their Ghostbusters release, Leslie Jones and Melissa McCarthy covered ELLE’s July issue. That same month, How to Be Single star Rebel Wilson fronted Marie Claire U.K.
As it was, transgender models were the least represented group, accounting for 0.7 percent of all cover bookings. Four of the five total appearances belonged to It model and Transparent star Hari Nef. It’s worth noting that on three of Nef’s four covers, she shared the spotlight with other (predominately cisgender) celebs. For ELLE U.K.’s September edition, Nef’s co-stars included Amandla Stenberg, Kristen Stewart and Zayn Malik. In February, Nef, Kylie Jenner, Rowan Blanchard and Matt Healy fronted Wonderland’s The Fame Issue. Nef later reunited with Stenberg and Blanchard for Interview’s claustrophobic April cover. The multi-hyphenate’s only stand-alone feature came on the April edition of Jalouse (the most obscure of Nef’s bookings). Women age 50 and above graced the covers of popular fashion publications 34 times in 2016, accounting for 5 percent of all bookings. This formidable showing was helped along by Vanity Fair’s comprehensive Hollywood Issue, for which Diane Keaton, Helen Mirren, Viola Davis, Charlotte Rampling and Jane Fonda all posed. In addition, W’s Royals cover portfolio featured the likes of Julia Louis-Dreyfus, Jodie Foster and Halle Berry. Later, the glossy honored acting and singing legend Barbra Streisand with a stand-alone December cover. Older models of color were not forgotten, either. 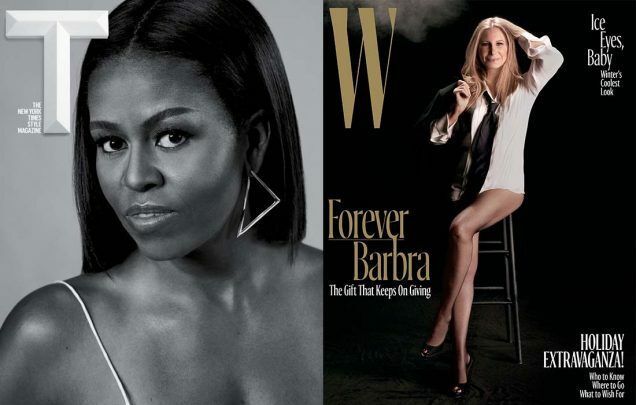 Michelle Obama memorably graced the covers of T Magazine‘s The Greats Issue, InStyle‘s October edition and Vogue U.S.‘ final issue of the year. In addition to Vanity Fair, Viola Davis covered ELLE U.S.’ February 2016 Women in TV Issue, where she appeared alongside Louis-Dreyfus, Priyanka Chopra, Taraji P. Henson and Olivia Wilde. The inimitable Iman Abdulmajid fronted L’Officiel Paris’ Gang of Africa September issue, though she shared her cover with Ajak Deng, Ciara, Maria Borges, Grace Bol, Riley Montana, Adesuwa and Anais Mali. As with transgender models, there’s a trend of magazines grouping their older cover stars with younger faces. (Perhaps in order to hedge their selling bets?) Regardless, between these figures and a record-breaking Spring 2017 runway turnout, the 50 and over set had a pretty solid 2016. It seems the fashion industry is finally taking notice of its older (more affluent, more devoted to print) base. This year’s list of the 10 most coveted cover stars is disappointingly light on diversity. It was the year of the Instagirl — but you already knew that. Over the past 12 months, Gigi Hadid has fronted more covers than any other model, nabbing 14 credits in total. She graced no less than eight international Vogue editions, including Italia, Paris (twice), China, Japan and Germany. The International Model of the Year also covered Harper’s Bazaar, WSJ. Magazine, CR Fashion Book, Dazed’s 25th Anniversary edition and W’s knee-free art issue, where she posed alongside BFF Kendall Jenner. For her part, Jenner landed 10 cover appearances, making her the second most coveted cover girl of 2016. In September, the reality star fronted U.S. Vogue’s mightiest of issues. The following month she landed four international Vogue covers: Japan, Germany, Australia and Spain, in addition to fronting Allure’s Best of Beauty Issue. She rounded out the year with stints on the covers of Vogue Brazil, Vogue Turkey and Harper’s Bazaar U.S.
Coming in third is Gigi’s sister Bella Hadid, who fronted nine high-profile glossies. Tied for fourth place is Oscar winner Alicia Vikander, British beauty Edie Campbell and Dutch models Lara Stone and Rianne van Rompaey, each of whom garnered seven cover credits. With six cover bookings apiece, Céline favorite Frederikke Sofie and Irina “bet you didn’t know I was pregnant on the Victoria’s Secret runway” Shayk share the number five spot. Last, but certainly not least, is Lupita Nyong’o, who graced five fashion covers in 2016. The acclaimed actress appeared on the covers of ELLE U.S., ELLE U.K., Vanity Fair, InStyle and Vogue U.S.
On the whole, 2016 was the most diverse year the fashion industry has ever seen. Its international runways were the most inclusive in recent history. New York Fashion Week featured an unprecedented number of curvy catwalk models. Major ads did a better job reaching a broad customer base than in seasons past. Beauty titan CoverGirl hired its first-ever male and Muslim spokespeople, James Charles and Nura Afia. And while magazines chose, for the most part, to follow the Instagirl-led crowd rather than try their hand as tastemakers, there were still significant improvements in representation. This being our last diversity data crunch of the year, we think it’s important to give 2016 (a dumpster fire of a year in other respects) some props. At least in the fashion world, progress persisted and even picked up speed. And while we’re not fortune tellers, Ashley Graham’s January 2017 British Vogue cover gives us hope that, in the coming year, the landscape will shift even more radically. With additional reporting by Mark E.
*For the purpose of this report, “model” is anyone who appears on a cover, even if modeling is not their profession. Models of color are categorized as those who appear to be nonwhite or of mixed backgrounds.